Facial redness (Rosacea) and broken capillaries (Spider veins) are a common result of sun damage, genetic predisposition and natural aging. Laser and Intense Pulsed Light (IPL) treatments work by selectively targeting and delivering strong bursts of light to the problem areas in the skin. In the case of fine capillaries, this causes them to coagulate and disappear. 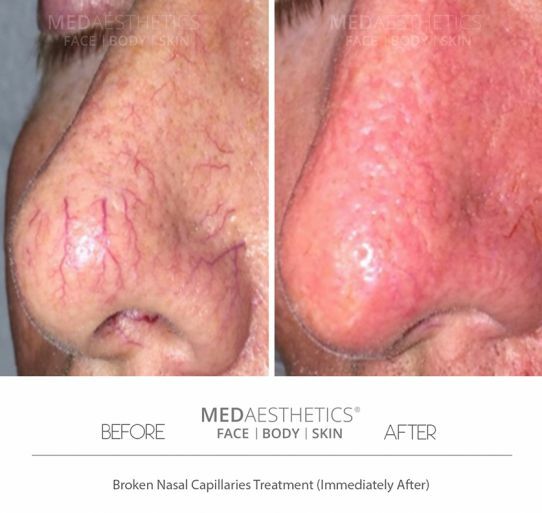 At Medaesthetics® we use the world renowned Sciton® BBL (Broad Band Light) and Lumenis™ Multipulse Nd:YAG platforms to treat facial capillaries and redness (rosacea) along with spider veins on legs. The BBL is a new advanced treatment for sun damage, facial capillaries, redness, pigmentation and general skin rejuvenation. The treatments also improve the general skin texture as an added value – with reduction in pore size. Any area of the body can be treated including the neck, chest and hands. Finally a safe effective treatment that can treat sun damaged hands necks and chests, removing sun damage, broken capillaries and brown age spots. The treatments are very quick, safe and highly effective with minimal downtime. In contrast to other technology (i.e. IPL) fewer treatments are required (2-3 compared with 5-6). The treatments are much less painful due to the physics of the machine as well as the sapphire cooling plate that cools the skin while the treatments are performed. This not only minimizes discomfort but also allows higher energies to be used and therefore greater results. The cooling mechanism combined with the variable pulse width and energy means we can also customize the treatments to suit and treat all skin types. Other technology does not allow as much variability in the settings of the machines and therefore are not necessarily suited to treating a wide variety of skin types. What does a BBL treatment feel like? The treatment lasts anywhere between 10 -20 minutes depending on how many areas are being treated (10 minutes for a face, 15-20 for face neck and chest). After the treatment the skin feels a little warm and ice packs are applied for 15-20 minutes. The warm feeling is usually gone after 30 minutes. At this point the skin is a little red, the majority of the redness is gone by the next day. Mineral makeup can be worn straight away. The brown spots and pigmentation go darker and gradually fade out of the skin over a week. There is no breaking or peeling of the skin. Treatments are performed 3-4 weeks apart. Is BBL able to treat Rosacea? BBL is also used to treat rosacea. Not only does it improve the look of the skin by removing the redness and capillaries, it also reduces the sensitivity of the skin that many rosacea patients suffer from. People with rosacea and redness prone skin usually have 3-4 treatments a month apart. 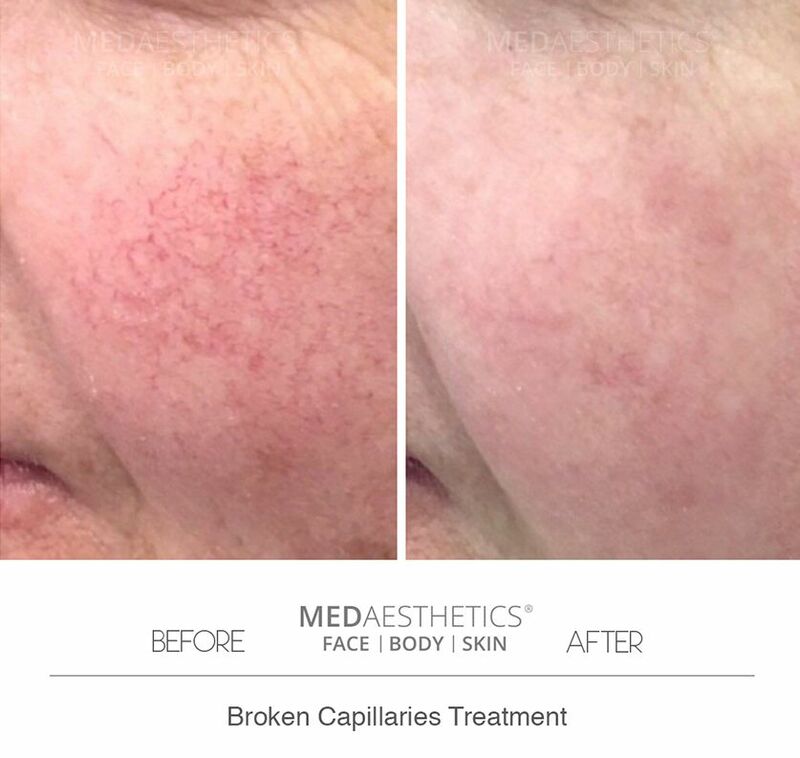 Medaesthetics® is the only clinic in WA to offer the latest Sciton BBL technology. Prices for BBL capillary removal session involving small areas may cost in the region of $100- $500 per session. Please contact our clinic for detailed pricing.